With the IRB Junior World Championship kicking off on Monday, we thought we’d come back to the 5 Up article that was written in the aftermath of the U20 Six Nations. Both Ulster outhalf Paddy Jackson and Connacht fullback Shane Layden have dropped out of the squad, which is a real disappointment. The Mole wasn’t all that taken with Jackson during the U20 Six Nations and didn’t include him in the original article. Since then he went on to start a Heineken Cup semi-final and final … hmmm. Nice judgment call! However, he was sidelined in the former with careful parenting by Ruan Pienaar and Paddy Wallace, the two experienced pros on either side of him, and patently out of his depth in the latter. A tournament like this would have seemed the ideal way to get back on the horse, but Ulster Rugby have deemed it prudent to pull him out of itso that he can concentrate on preparing for the next season of provincial rugby. The argument in favour of that move is that the JWC is a brutal tournament with four-day turnarounds that demands a huge amount from the players and leaves them physically exhausted; the argument against is that he’d have ample opportunity to rebuild his confidence playing age-group rugby before he moved permanently into senior level. Layden is another big loss, having proved himself a natural try-scorer in the U20 Six Nations with five-pointers against Wales, Italy and Scotland. While Jackson captained the side, The Mole felt that the young Connacht man was a natural leader along with being the most dangerous attacking weapon in the backline. Mikey Sherlock of Leinster will likely step in for him in the No15 jersey; Sherlock was talented enough to start four games in last year’s Six Nations as an U19, so the signs point to there being less of a drop-off in ability than one might otherwise expect. 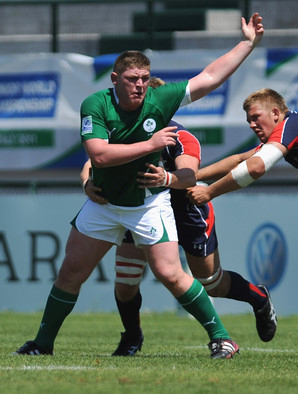 Tadhg Furlong: the New Ross and Leinster Academy prospect missed a lot of the season recovering from injury, but is back in the saddle for the Ireland U20s. The transition from underage rugby to the senior ranks is rarely smooth, but The Mole is going to put his head on the chopping block and predict that he’ll be Ireland’s starting tighthead at RWC15. One player that wasn’t featured in the original article [because he missed almost the entire season recuperating from surgery] is New Ross tighthead phenom Tadhg Furlong. 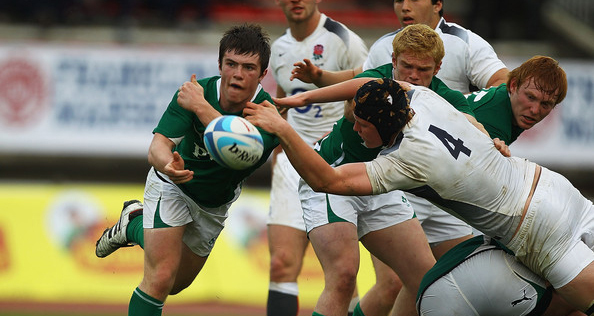 Furlong played in last year’s edition of the tournament as an 18-year old, and was consistently one of Ireland’s best players – no small ask, because he started five games in seventeen days. He was a revelation, having not featured in a starting lineup in that year’s Six Nations. The Mole has only seen one Irish prop in the last decade who has shown anything like Furlong’s potential in underage rugby: Cian Healy. It might be a little rash to say on the back of those five games, but The Mole believes that Furlong has the build, the strength, the toughness, the skillset and the intelligence to be a long-term international tighthead. Iain Henderson started as a blindside against Munster in Thomond Park in an understrength Ulster team and scored an absolute cracker of a try, showcasing his athleticism. The young lad has prototypical size, and while he’s nowhere near 20-year old southern hemisphere mutants Brodie Retallick and Eben Etzebeth, for an Irish second row he’s a long way ahead of the curve in terms of physical development. Most Irish U20 locks struggle to break the 105kg mark, while Henderson is already hitting 115kg … and as the clip above shows, he can do something with it. There’s absolutely no harm playing blindside as a young second-row – very, very few 20-year olds are powerful enough to lock a senior scrum, and it’s better to get the time on the pitch and feel the pace and the physicality of professional rugby than sit in the stands and hold on to your second-row status for the Olympics. Luke McGrath stood in for the injured John Cooney for Leinster ‘A’ in the cracking British & Irish cup semi-final against Munster ‘A’ that went into extra time in the RDS on Good Friday. The youngster stepped up to the mark well and bagged a try, outplaying his 26-year old opposite number Duncan Williams for most of the game. With another season at this level in front of him, and another very capable scrum-half in Kieron Marmion in the squad for the tournament, The Mole thinks it likely that we’ll see both No9s used in the way that Leinster have used Eoin Reddan and Isaac Boss over the last two seasons. EDIT: McGrath also made his senior Leinster debut this year, coming off the bench to replace Eoin Reddan for eleven minutes against Newport Gwent Dragons in early May. Hanrahan sniffed the gap and then scorched through it to set up Ireland’s only try against Wales in the U20 Six Nations opener. What the photo doesn’t show is the beautifully weighted pass he threw for Shane Layden to score. JJ Hanrahan also started that semi-final but struggled to make an impact. Oddly enough, it seemed that the game never really came his way in attack, even as a No12. While he defended solidly, Leinster lost two inside centers in quick succession and he wasn’t able to capitalize on a disrupted backline defense. That’s just one game, however. At age-group level he has consistently looked skillful, rounded and astute, and The Mole expects more of the same from him. Having played a lot of rugby at outhalf at club level, it will be interesting to see if he’s asked to play in the No10 during the competition – he’s got the all-round game and the judgment to do it, but it’s difficult to tell if it’d be the best thing for him at this stage of his development. Conor Gilsenan featured in four of Leinster’s British & Irish Cup games before being squeezed out of the semi-final line-up by the returning Dominic Ryan. While he played most of the games of the U20 Six Nations at blindside to accommodate Connacht’s Aaron Conneely on the openside, The Mole feels that his future lies in the No7 jersey. I’d expect to see an all-Leinster backrow of Gilsenan/Coghlan/Conan in at least one of the games. Ireland kick off their campaign against hosts South Africa on Monday afternoon, and to keep up to date, check out the IRB’s comprehensive website. This entry was posted in Opinion and tagged Conor Gilsenan, Iain Henderson, Ireland, Junior World Championship, Luke McGrath, Mike Ruddock, Paddy Jackson, Shane Layden, Tadhg Furlong, U20s by dementedmole. Bookmark the permalink. So the New Ross man is the new Ross? I’ll get my coat. A classic pun is always welcome on this website. Think my favourite memory of Tadgh Furlong last year was him passing better from the base than either scrum-half. Serious prospect. Has the potential to completely eclipse Mike Ross. p.s. If things go right for Jackson next season, this will be his last summer off for a long time. Wise not to flog him. Furlong’s passing skills were out of the top drawer last year. Every time he got on the ball, he did something well – I was hoping he’d take over the goal-kicking at some stage. Looking forward to seeing Peter Nelson, sounds like a guy with a lot of talent. Doesn’t seem to be listed in the Ulster Academy, strangely. Ulster Academy page with the profile pics is about as up to date as Rip van Winkle. 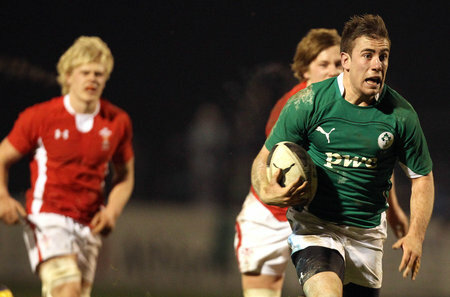 That said, go to this page – http://www.ulsterrugby.com/rugby/academy.php – and scroll down until you see the list for Phoenix Ulster Academy Squad 2011-12. He’s in it. Alternately, they haven’t put up his pic as they want to spare people from how ginger he is. Cheers for that mole, this is a super tournament and would be a great excuse for a holiday, but alas not this year. Is anyone televising the games? eurosport did before I think. Don’t like heaping too much pressure on youngsters, but there is no doubt furlong catches the eye. Just really hope his scrum is as good as the rest of his game. Don’t like heaping too much pressure on youngsters, but there is no doubt furlong catches the eye. Just really hope his scrum is as good as the rest of his game. If he has that, he is home in a boat. If not, he is nowhere. Seems a good kid though. Thought this would’ve been the ideal platform for Jackson too, with being el capitano et al. I get the logic of holding him back and i guess it will mean another kid getting good exposure, but could’ve done Jackson the world if good. Yeah, scrummaging is a known unknown [Jesus, I love that phrase] when you’re talking about the step-up between age-group rugby and senior level. It’s so difficult to be physically able to compete as a 20-year old against guys who have been lifting weights, eating and scrummaging competitively for a decade longer than you. On the other hand, some guys are simply better than others. The big Waikato Chiefs lad Ben Tameifuna was playing in the JWC last summer and is in the All Blacks squad this year as a 20 year old TH. Granted, he’s about 134kg, but Furlong is a less sloppy 118kg already. It’s not that Furlong should be in the Irish squad next year, but most good players break through early, even in the front row. Cian Healy started against the Australians about five weeks after his 22nd birthday and Rory Best started against the Kiwis when he was 23. There shouldn’t be too much luck or hope involved, it should be a fairly clear pathway for very talented guys. Yeah, fair enough. He is in good hands and will get a fair share of game time next year you’d imagine. Easy to see him coming on as the game breaks up a bit in the last 20 and (crucially) against slightly de-powered scrums, where he can build his game at pro level. This is a bit of a tangent (and I know its far away,but we should really be making plans towards it….Lancaster has already stated that he is) but one person who would help TF make the next world cup is madigan. You’ve raised how he could also play 9. I am of the opinion that taking 3 out and out 9s to a rwc is overkill. It is the least injured position in the game. Leinster and ulster have basically covered it with 2 guys for 2 years. Yet (for what is usually a maximum of 5 games) at the rwc we need 3 specialists? If madigan is able to cover both, then that could give you the freedom to: pick another prop, maybe another openside, bring an experienced player for their influence, or utility back. Bringing the extra prop would look to make the most sense in order to manage Ross’ workload and get the most from him when needed. An awful lot can change in that time, but we are almost a quarter of the way to the next rwc. Get the feeling of opportunity not taken for madigan and this NZ trip. Luke was three years below me in school, an incredibly humble and genuine guy who has the work-ethic and temperament to be a top pro. Mole I was wondering what do you make of the fact that only 3 Munster players are in the JWC Squad. While obviously it reflects poorly on the quantity of young players produced, I think it is interesting that both Scanell and JJ Hanrahan are the captain & vice-captain showing that they have leadership potential for Munster. Note that McGrath (Senior Cup runner-up captain) and Gilsenan (Senior Cup winning captain) were passed up for the captain’s armband for this match. When you consider that O’Mahony also captained Ireland at 20’s level then it must be a good sign. Your thoughts? As regards the captaincy issue, McGrath was probably passed over because he’s U19 and isn’t a definite starter [Marmion is a decent scrum-half and played in last year’s competition as an U19 as well]. Similar situation could be in place with Gilsenan, who mightn’t start every match with Coneelly in the squad. JJ Hanrahan has played in this competition before and looks like a very mature footballer in terms of his decision-making. Not sure about Scannell – maybe it’s as simple as being a sound, charismatic lad who everyone in the squad respects? To be honest though, I have no idea. I don’t even know if the captain is voted for by the players or appointed by the manager. McGrath’s a serious class act. Been watching him for a few years now at Schools’ level; a shame that he wasn’t around when Michaels finally made the breakthrough. I’m rather less convinced by Marmion. I’ve heard speculation that he’s got the number of starts he did for more-or-less political reasons; he’s a recruit to Irish rugby, having been born and raised in the UK to Irish parents. Then again, if they didn’t think he was a serious project, I don’t see why there’d be so much effort to keep him, so I could be wrong. He’s never impressed me near as much as McGrath, though. IIRC, Hanrahan alternated with Jackson in the 10 slot in last year’s 6N? He should be well able for the role. It’s a great tournament, this. I was looking again at the programmes from the final and semis of the u21 tournament in 2004. The Sefrican and Strine sides were full of what are now star names, but this was the Baby Blacks side that beat Ireland in the final: Glenn Horton; Tony Koonwaiyou, Ben Atiga, Luke McAllister, Rudi Wulf; Stephen Donald, Toby Morland; Ben Franks, John Pareanga, John Afoa; Craig Clark, James Ryan; George Naoupu, Jonathan Poff, Jerome Kaino. Piri Weepu, Hosea Gear, Jimmy Gopperth, and John “Mahonri’s brother” Schwalger in the subs as well. Awesome talent, and awesome skill-levels on display in those three games I saw. Why are there so few Connacht lads in the squad and team? They won the Interpros, after all. Gonna hold my hand up and say my info was wrong on Marmion, he did well. Excellent performance by Hanrahan too, despite some wayward line-kicking; the altitude probably takes a bit of getting used to, in fairness. Superb performance all around. Great game, really enjoyed it. Bit of a loopy left handed pass on marmion, but its accurate and a lot to like about him. He played very well and, though i hate box kicks, he and mcgrath box kicked brilliantly. Considerably better selection and execution than their opponents anyway. Lots to like out there though, impressive.